All in favor of not wanting this summer to end? Hand.raised! I can't get enough. It's been one of the best summers, even if I'm waddling around 9 months pregnant during it. 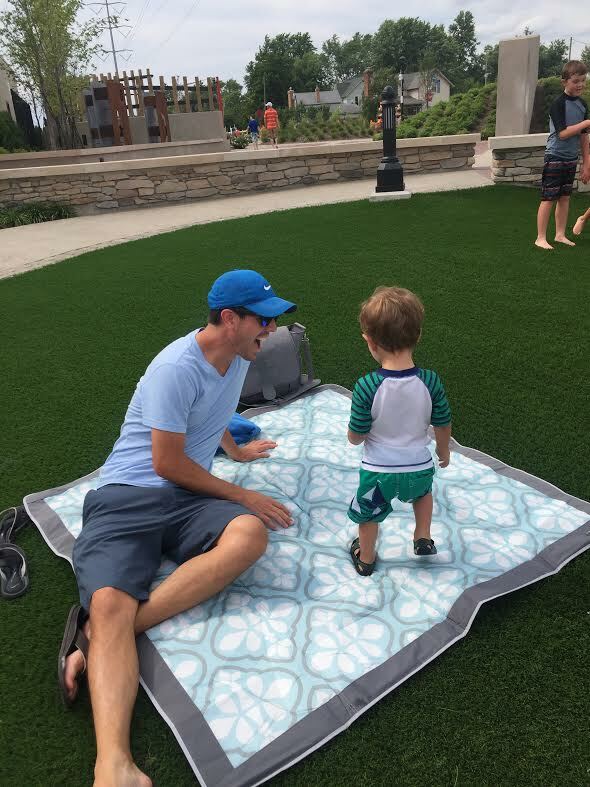 The weekends have been packed full with fun outdoor activities...taking Cam to the splash pad, long walks downtown, trips to the Zoo, bike rides, eating outside, playing at the park, boating at the lake, and so on. Over the past few months I've found that there are certain things that are essential for us to keep stored in my trunk so that we always have them when we're out and about. The first is the JJ Cole All Purpose Outdoor Blanket. I can't tell you how much use I've gotten out of this blanket! We've used it since Camden was really little, and are using it even more now that he's getting older so it's definitely worth buying. We use it for him to eat on, for me to sit down and relax when he's playing, and even to change his diaper on when we're at the park. It folds up really nicely and has a strap so that it's easy to carry. A must have for the warmer months when you spend a lot of time outside. The next is my JJ Cole Backpack Diaper Bag. 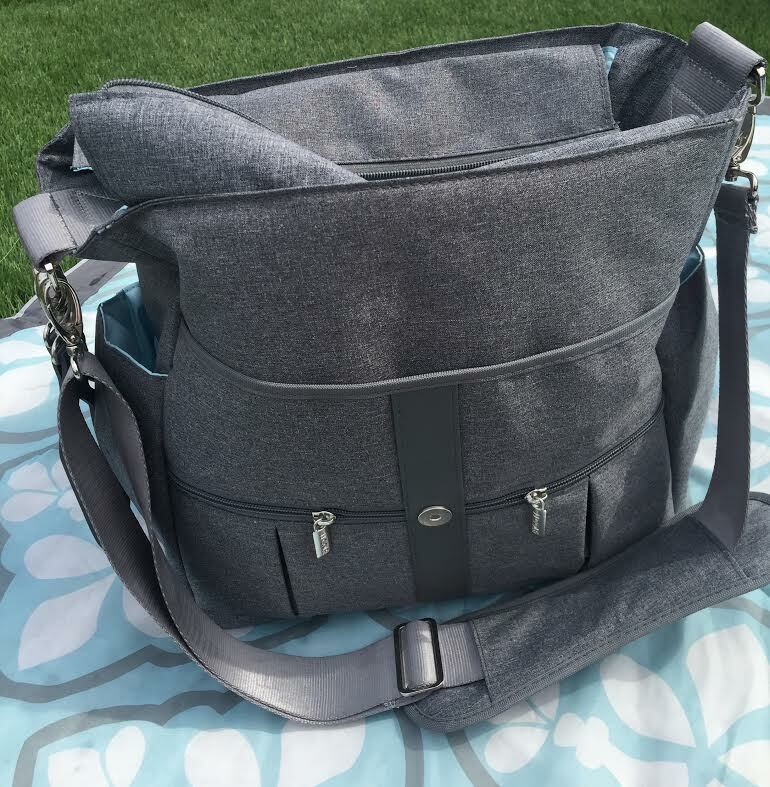 I knew when I got pregnant with baby #2 that I wanted to switch to a backpack diaper bag, but I really wish I would've just switched to one earlier. It's so much more convenient to be hands free and they fit so much in them. They may not be the most "trendy" thing a women in her 30's could wear, but I honestly don't even care ha! Billy even commented how he prefers the backpack style for when he carries the bag. Both the outdoor blanket and diaper bag can be purchased at Buy Buy Baby! I love this diaper bag for many reasons (ELEVEN pockets, the inside compartment is super spacious, plus the look of it is really nice to name a few), but I really love that it also has a shoulder strap so you have the option to carry it that way or as a backpack. Sometimes I need to just quickly grab it out of the car and that's when the shoulder strap comes in handy. This bag can be easily wiped down so you don't have to worry about stains! Highly recommend it if you're in the market for one. 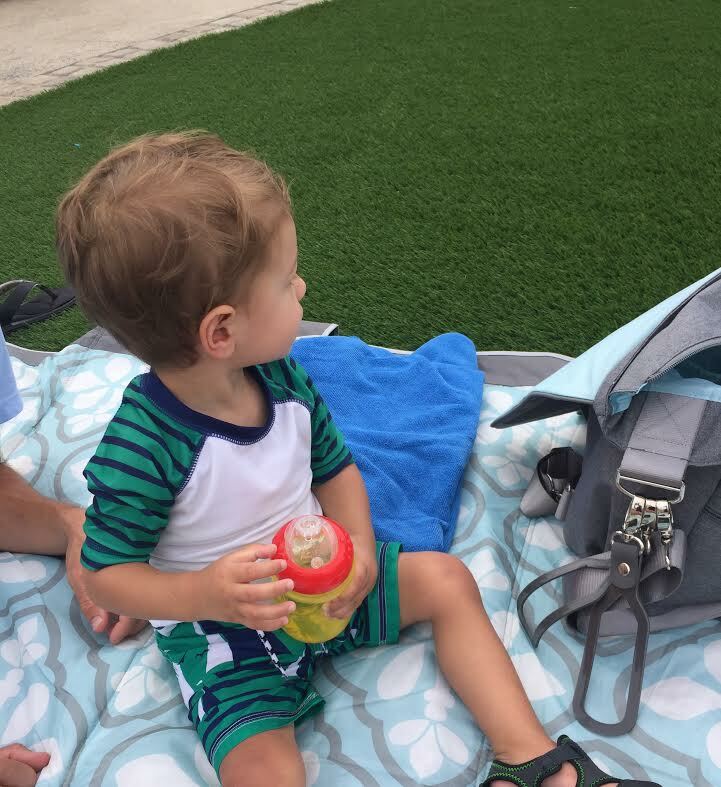 As far as sunscreen goes (obviously the most important thing when your little one spends so much time outside) my absolute favorite is Mustela's SPF 50+ Broad Spectrum Mineral Sunscreen Lotion. It offers protection for the face and body and is paraben-free, fragrance-free, and hypoallergenic. Camden has never once got burnt when I use it on him, so it's literally the only sunscreen I will use. Something else I did recently that has been really helpful is put together a "car emergency kit" for each kid that has an extra set of clothes, diapers, wipes, and hat in them. These stay in my trunk and I just make sure if/when I use something that I replace it that night. I also store a sippy cup in Camden's bin, just in case I were to ever forget one since it's so hot out. His bin gets some little toys too that he can play with while in his car seat. I'm a little mad at myself for not doing this sooner! What are your summer essentials when out and about with your kids? Thank you to JJ Cole for sponsoring this post. As always, all opinions are my own! Oh I don't leave the sunscreen in the car, just the blanket! I keep the sunscreen in my diaper bag :) thanks for the heads up though!! We have an outdoor blanket that we keep in the car and it's awesome to have!